Sure it’s Thanksgiving week and you’d expect any major product release to be worried about turning into, well, a turkey, right? Hold onto your hat, because today is the day that one doozey of a product is being released. 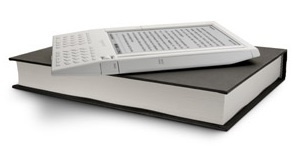 While digital e-book readers have been traditionally treated like foul fowl, a new venture from Amazon.com might turn the tide from e-book flop to electronic book wonder. Removable SD storage media; but purchased books are stored @ Amazon.com, plus unsubstantiated rumors indicate that you can’t transfer books between Kindles.